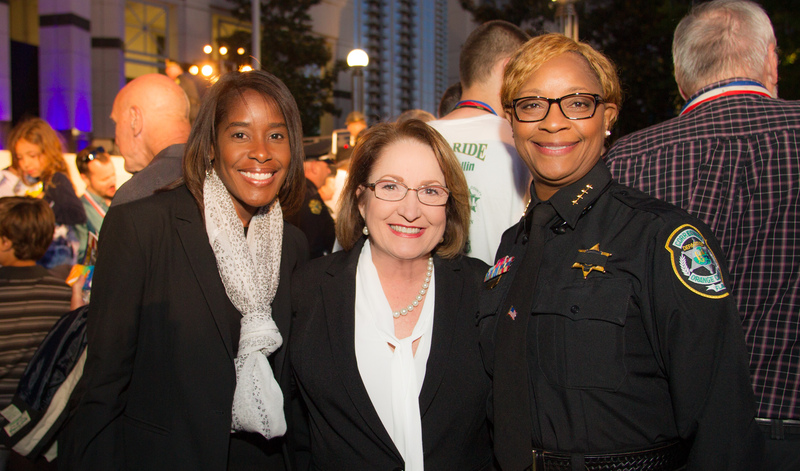 Orange County Mayor Teresa Jacobs recently joined community leaders and local law enforcement agencies for the 34th Annual Law Enforcement Memorial Ceremony to honor the legacies of the region’s fallen law enforcement officers. Held annually in the courtyard of the Orange County Courthouse, the ceremony paid tribute to those who have suffered a serious injury; officers who died of natural causes and the brave men and women who currently serve the community in uniform. The names of the 46 law enforcement officers who died while serving Orange County since 1870 are engraved on the Law Enforcement Memorial Monument. The memorial is the centerpiece of the courtyard at the Orange County Courthouse and was dedicated in 2000. Mayor Jacobs was recognized at the emotionally moving and solemn ceremony. Attendees included family members and representatives from 28 federal, state and local law enforcement agencies working in Orange County as well as judges and other elected officials. Orange County continues to grieve for the loss of two officers who tragically lost their lives in senseless acts of violence in 2014 – Deputy Scott Pine of the Orange County Sheriff’s Office and Officer Robbie German of the Windermere Police Department. Their names were engraved on Tallahassee’s memorial wall to fallen law enforcement and were recently added to the National Law Enforcement Memorial in Washington. The ceremony, sponsored by the Fraternal Order of Police, began with a memorial parade to the courthouse grounds featuring officers on motorcycles, honor guards, bag pipe players, drummers, uniformed personnel, survivors and guests. The motorcycles from various law enforcement agencies lined the sides of the plaza and later illuminated the courtyard with red and blue lights during the lighting of blue candles at dusk. Stories of the fallen law enforcement officers honored at the Orange County ceremony can be found by searching the name of the agency through the nonprofit organization Officer Down Memorial Page, Inc. Photos from the 34th Annual Law Enforcement Memorial Ceremony may be found on Flickr for use by the media.